Single Photon Emission Computed Tomography (SPECT) allows quantitative whole-body molecular imaging of cancer. One class of molecular radiopharmaceutical incorporates a radioactive metal bound via a chelator attached to a peptide or protein, which targets cell-surface receptors of diseased cells. Tc-99m (6 h half-life) is a radioactive gamma-emitting isotope that is widely available, and it is used for SPECT imaging in 30 million scanning procedures worldwide per year. The Tc-99m radiopharmaceuticals used in these procedures are largely based on Tc-99m complexes of simple chelators. Bidentate dithiocarbamate (DTC) and diphosphine (DPP) chelators have been used in preparations of Tc-99m-myocardial perfusion agents, Tc-99m-Noet and Tc-99m-tetrofosmin. These radiotracers are simply and routinely produced in hospital radiopharmacies using aqueous pertechnetate, commercially available “kits” (containing reducing agent, buffer and chelator) and a syringe. However, in their current form these DTC and DP chelators are not suitable for conjugation to receptor-targeted molecules. In this project, the student will develop new DTC and DP chelators that can be attached to peptides and other small targeting molecules. 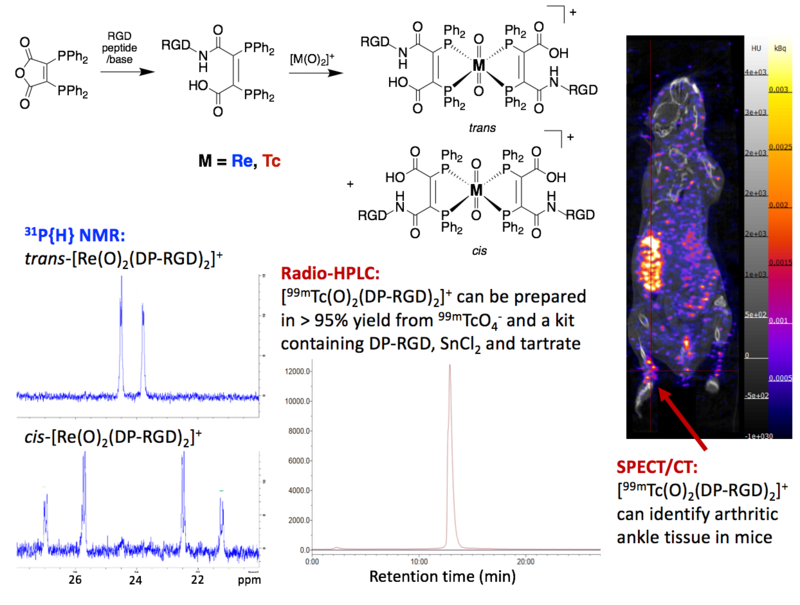 The student will then radiolabel these bidentate chelator-peptide conjugates with Tc-99m, and undertake preclinical in vitro and in vivo studies (including small animal SPECT imaging) to assess the radiotracers’ utility for imaging disease processes. In the first instance, the student will develop chelator-peptide conjugates using a peptide that targets prostate cancer, to both demonstrate proof-of-principle of new chelator chemistry, and develop a radiopharmaceutical suitable for clinical and commercial translation. Upon metal binding, the number of copies of targeting peptide per molecule will be doubled. Such “multimeric” derivatives containing two or more peptide copies demonstrate higher receptor affinity over their monomeric homologues1. Our initial studies have shown that a new diphosphine-peptide conjugate, DP-RGD can rapidly complex Tc(V) and its chemical congener, Re(V). The new Tc-99m-radiotracer can be prepared in >95% radiochemical yield using a single-step kit. NMR studies using the analogous non-radioactive Re complexes show that the radiotracer consists of both cis and trans isomers. Preliminary in vitro and in vivo SPECT/CT studies show that this radiotracer has affinity for its intended αvβ3-integrin target receptor, and can image αvβ3-integrin expression in joints of arthritic mice. This project is highly collaborative. As well as working with the Wilton-Ely group, who have expertise in the construction of nanoparticles functionalised with Gd-DTC surface units, including assemblies capable of combined MRI and photodynamic therapy,2, the student will work with chemists in Bristol (Prof Paul Pringle) on developing new phosphine ligands, and Prof Blower (King’s College London) who has experience translating radiopharmaceuticals to the clinic3. (1) Imberti, C., Terry, S. Y. A., Cullinane, C., Clarke, F., Cornish, G. H., Ramakrishnan, N. K., Roselt, P., Cope, A. P., Hicks, R. J., Blower, P. J., and Ma, M. T. (2017) Enhancing PET signal at target tissue in vivo: dendritic and multimeric tris(hydroxypyridinone) conjugates for molecular imaging of αvβ3 integrin expression with gallium-68. Bioconjugate Chemistry 28, 481-95. (2) Sung, S., Holmes, H., Wainwright, L., Toscani, A., Stasiuk, G. J., White, A. J. P., Bell, J. D., and Wilton-Ely, J. D. E. T. (2014) Multimetallic Complexes and Functionalized Gold Nanoparticles Based on a Combination of d- and f-Elements. Inorganic Chemistry 53, 1989-2005. (3) Young, J. D., Imberti, C., Meszaros, L. K., Ma, M. T., Terry, S. Y. A., Mullen, G. E., Blower, P. J., Abbate, V., and Hider, R. C. (2017) 68Ga-THP-PSMA: A PET imaging agent for prostate cancer offering rapid, room temperature, one-step kit-based radiolabeling. J Nucl Med 58, 1270-77.